Fiction or nonfiction? I write both fiction and nonfiction. Are you published? Yes. I started writing professionally nearly 20 years ago. At that time, I had my heart set on being a picture book writer. I found out it was very tough to get published as such, so I turned to other forms of writing in order to create a portfolio of published work. I wrote a couple of poems that were published in a local newspaper. I became the Publicity Chair for my daughter's Girl Scout Troupe as well as for her elementary PTA and then her high school marching band (and later at my son's elementary school and high school). As such, I wrote lots and lots of press releases about the various groups' activities. These were published in local newspapers as well. I wasn't making much money, but I was compiling a long list of publishing credits. During this time, I sold a children's story to Highlights for Children and another one to Our Little Friend. And, I somehow managed to convince the editor a Franklin Watts to take a look at a proposal I had for a series of children's craft books. He liked the idea and wanted to see more. To make a very, very long story very, very short, I am now the author of eight craft books, known as the "Mania Craft" series because each title in the series has the word mania in it, i.e., MILK CARTON MANIA, CRAFT STICK MANIA, CARDBOARD TUBE MANIA, etc. After Children's Press (which bought out Franklin Watts) published them in 2002, Gramercy Press (a division of Random House) bought the rights to publish a "bind-up" of three of the volumes and called it CRAFT MANIA. I am also the author of a fictional picture book, ISAAC THE FROG, published by Sprite Press, a very small press owned by a friend of mine, as well as a book that I self-published along with two of my friends called THE LITTLE LIGHTHOUSE. I thought I had it made when it came to writing stuff for kids. I mean, I had a whole series of books under my belt. Every editor would want to publish my material. Right? Wrong! I hit a dry spell where I didn't sell anything and I didn't have much published. I was getting very discouraged. So I looked around for more ways to get exposure as a writer. That's when I came across an opportunity to start writing book reviews of an online website, called Christian Children's Book Review. I started writing book reviews for them several years ago, and still write for them today. I now write reviews for other sites, as well: Book Reporter, Teens Reads and Kids Reads. And, I branched out into writing articles, recipes and blurbs for websites on a freelance basis. In the past few months, although I continue to write book reviews and articles for websites, I have turned my attention back to writing for children, specifically in the form of picture books. I joined Julie Hedlund's 12 x 12 group, and was so inspired by all the wonderful posts from fellow members, I am now a member of Kristen McGill Fulton's WOW nonfiction FB page, as well as the 12x12 Member's Forum, the 12x12 FB page, and the Children's Book Creative FB page. I also belong to two picture book critique groups, one for fiction and one for nonfiction. Do you do anything in addition to writing? I do editing and proofreading on a freelance basis. I also do something this is unrelated to writing, and that is crafts. 1) Through this blog. Just post a comment and I will get it. Or email me at: alamarr@sbcglobal.net. 2) Follow me on Twitter. The "Twitter" button is on the right-hand side of this blog. 3) Make me your friend on Facebook. 4) Link with me on LinkedIn. 5) Pin with me on Pinterest. 6) Read my book reviews on the Christian Children's Book Review website. 7) Read my book reviews on the Book Reporter website. 8) Read my book reviews on the Teen Reads website. 9) Read my book reviews on the Kids Reads website. 10) Read my book reviews on Amazon.com. 11) Visit my author page on Amazon.com. 12) Like my Stitches 'n Pearls Facebook page. This page is set up for my crafts as well as for my daughter's jewelry-making. I think I've covered everything. If you have any questions or comments, I'd love to hear from you! I know you...;~)...my followfest post drops tomorrow. Good luck and I hope you get a ton of followers! Good luck with the followfest! Thanks, Donna, you're the bestest!!! Good luck on your Follow Fest also. I will check your post out tomorrow!!! Whew! That's quite the history. There's nothing better than writing though, right? I had a 6 year hiatus at one point, and I seriously think I chopped a piece of my soul away. It's back, and no longer tender, but I'm not anxious to EVER do that again. Hi Christine, great to meet you through Follow Fest! I'll go and connect with you other places online as well. Best of luck to you! Thanks to everyone who has stopped by so far. I haven't had a chance to visit everyone else's blogs yet, but I will do so soon. Thanks, again!!! Great to meet you! It takes a lot of creativity to make picture books and I admire your hard work. Melissa and Loni, thanks for stopping by!! Breaking into Highlights is no small achievement -- well done! Following you on Twitter, FB, and "liked" your Amazon page. Hi Christine! 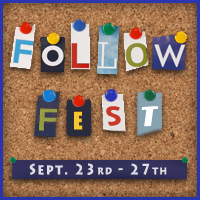 Fancy meeting you at Follow Fest. It's always great running into a fellow 12x12er. I dub you the Craft Queen! It's great to meet another children's writer! I'll go check out your other links. It's nice to meet you. You've done a lot of stuff! Thanks for participating in this...it's a pleasure getting to know everyone. Hi there. Great to meet you on this fun blog fest! Romelle, I humbly accept the title of "Crafting Queen". Thank you so much! Milo, thanks for the kind words. Everybody, thanks for stopping by my blog!! So glad to find your blog! I look forward to checking out your links as well. Especially the Christian Children's Book Review. Inspiring to read that you sold a story to Highlights when you were starting out. That is one of my goals right now. Sounds like you have an exciting publishing career. Nice to meet a children's author on this fest! Good luck on your endeavors! Hi, Christine! It's so nice to meet you and I'm looking forward to following your blog. Heading over now to connect on your other sites. Julie, thanks for stopping by! It's nice to meet so many wonderful people. Hello, Christine!! Nice to meet you Christine! Hi, Christine! Wow, you sound really accomplished. I'll have to take a look at some of those craft books for my own kids. It's really interesting how you ventured into book reviews, too. Good luck with all your writing! Nice to meet you Christine!! Nancy, Cathrina, Jennifer and Ashley, thanks so much for stopping by! Liked and Followed (minus LinkedIn) you. Hi Christine. Glad to meet you, Christine. I have bookmarked your review sites, made a friend request on FB and like your page. i really like the Rate your Story and plan to check it out. I have a You Write Like Who badge on my blog. It seems fairly accurate, to my surprise. Check it out. I'll be back in touch with review requests. Will review any rules you may have posted first, so just email you. The Follow Fest has been very informative and I've made a lot of new friends.